The 56-CST205 electronic total station from CST/berger is a full featured and economically priced total station that's suitable for a wide variety of measuring applications. 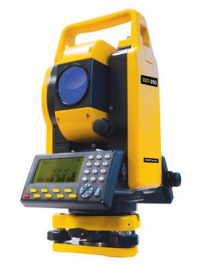 This top quality total station offers numerous notable features including an impressive measurement range of over 5200 feet with a single prism and just over 8200 feet with a triple prism, exceptionally accurate measurements, top quality optics with 30X magnification, single axis (vertical) compensation that makes up for tilts on the X-axis, superior EDM accuracy, intuitive and easy to operate onboard software, built-in data collection functionality, versatile data upload and data transfer capability, and superior battery life from the NiMH battery. In addition the 56-CST205 total station also features exceptional durability and rugged construction which makes it perfect for all types of measurement work in the field. The 56-CST205 is an exceptional choice for all of your precision measuring applications including surveying and construction, mapping and GIS, environmental studies, and geomarking. CST/berger is well known for offering top quality and affordably priced precision measurement solutions for the surveying, construction, and civil engineering industries, and the 56-CST205 electronic total station is a an excellent example of their high standards. New and used CST/berger 56-CST205 total stations available on eBay. Competitively priced while offering a full array of industry-standard features. Superior ease-of-use means less time spent on training and more time getting work done. Excellent build-quality and durability means decreased down-time and greater productivity. Dimensions: 21" x 13" x 17"